Submitted by Norm Roulet on Sun, 10/03/2010 - 22:57. One of the greatest tricks about living in Northeast Ohio is preventing harmful lead poisoning exposure for children and adults living here - some neighborhoods of Cleveland still have around 30% of children showing harmful levels of lead in their blood, causing permanent physical and mental harm. So it is appropriate the United States Senate has declared the week before Halloween - October 24-30 - as National Lead Poisoning Prevention Week, which "calls upon the people of the United States to observe National Childhood Lead Poisoning Prevention Week with appropriate programs and activities." In the spirit of the millions of Americans harmed by lead poisoning over the years, now dead and haunting those who cause such environmental harm on Earth today... may 2010 be the year when Northeast Ohio leaders get serious about protecting our children and adults from the trick of lead poisoning, as that is the greatest treat they may ever give to this community and themselves. Was this reported in Cleveland? Rhode Island's Senator Jack Reed introduced Senate Resolution 650, passed by unanimous consent yesterday, declaring that October 24-30 is National Childhood Lead Poisoning Prevention Week. Senators Boxer, Cardin, Collins, Dodd, Johanns, Menendez, and Whitehouse joined Senator Reed in sponsoring the resolution. Many thanks to Senator Reed and the co-sponsors. 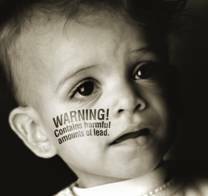 (2) calls upon the people of the United States to observe National Childhood Lead Poisoning Prevention Week with appropriate programs and activities. CDC's Lead Poisoning Prevention Week Toolkit has resources like posters, public service announcements, logos, etc. at http://www.cdc.gov/nceh/lead/nlppw.htm. Using these free tools can help advocates and programs to spread the word that childhood lead poisoning can be eliminated.